Image caption The RMT said it had concerns over the "ageing Piccadilly Line Fleet"
Tube drivers on the Piccadilly Line have finished the first of three 24-hour strikes. The RMT and Aslef unions said there had been a breakdown in industrial relations with issues including the age of trains not resolved. London Underground (LU) said the strike was "indefensible" and managers remained available for talks. About 400 drivers on the Piccadilly Line, members of Aslef and RMT, began striking at 21:00 GMT on Wednesday. The London Underground line carries some 600,000 passengers a day and is the only Tube service to Heathrow. 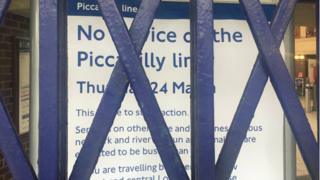 The union said several issues had led to the call for strike action, including concerns over the "ageing Piccadilly Line fleet", which had "left drivers in a vulnerable position". RMT general secretary Mick Cash said members had been "rock solid" in their support and were "making a stand against bullying, the ripping up of procedures and in defence of the safety of staff and passengers". Finn Brennan, Aslef official, said: "So far senior management have not been prepared to intervene or even to meet with the trade unions. They are taking a completely hands-off attitude." However, LU operations director Pat Hansberry called the strike "indefensible" as it was in support of "drivers who refused to drive Piccadilly line trains on their shifts - without good reason - resulting in delays to our customers." Transport for London (TfL) is providing updates on its website, and @TfLTravelAlerts, @TfLTrafficNews and @TfLBusAlerts. It said people travelling to the airport could use Heathrow Connect and Heathrow Express services and extra buses. The RMT is also due to strike on 19 and 21 April. The Piccadilly Line has some of the oldest trains on the network, known as "1973 stock", and in January experienced a problem with a door opening on a moving train. TfL subsequently said it had carried out checks that showed it was an "isolated incident".